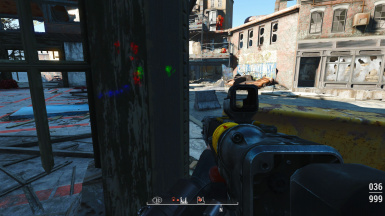 Pip-Boy and Power Armor attachments that highlight friendly, enemy and corpses. Also includes Mentats that highlight corpses. 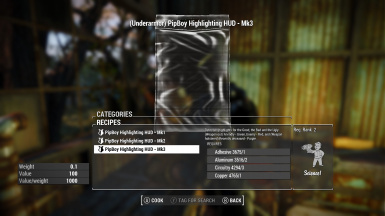 Removed from crafting menu Pip-Boy Highlighting HUD's Mk1, Mk2, Mk3, Mk4 and Mk5 are no longer needed they are replaced by modular version. Changed range for PA to 500 from 150 for deceased, PA-x version use same values. Alternate 2 version changes: Enemies have a purplish cloud around them that makes them "visible" though walls. Dead highlight changed to Blue instead of Purple for PB and PA. Corpse are no longer visible though walls. Alternate version changes dead highlight to Blue instead of Purple for PB and PA, may help performance. Corpse are no longer visible though walls. Added Mk5 versions - (Weapon out) Enemy - Red. Weapon holstered turns off highlights. 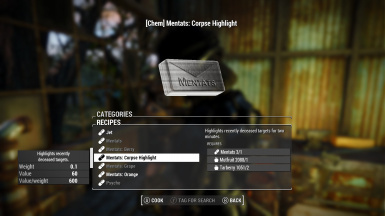 Corpse highlight - decreased purple mist brightness but increased highlighting on the body. Mentats - increase duration to 4 minutes. 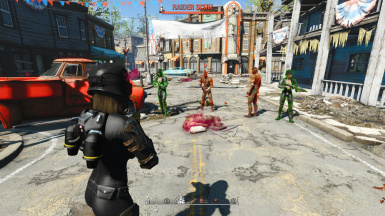 Pip-Boy and Power Armor attachments that highlight friendly, enemy and corpses. Controllable with weapon drawn or holstered. Also includes Mentats that highlight corpses. Craftable at the Chemistry station in Drugs. After crafting it will be placed in the apparel section of the PB. It uses no body slots. Multiple versions can be equipped at the same time as long as the setting do not conflict. If the setting conflict only equip one version at a time. Change the setting at the armor workbench, default setting are off. Pip-Boy Versions - Range 750 (living), 400 (dead). Pip-Boy eXtended versions - Range 500 (living), 150 (dead). 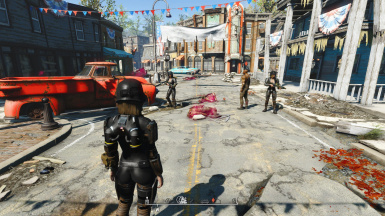 Pip-Boy eXtended versions include a "Heat cloud" around the target making it "visible" though walls. Pip-Boy versions are disabled while in Power Armor. 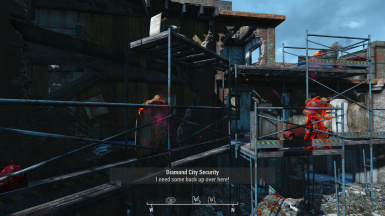 Modular setting can be changed at the armor workbench for the Good (Friendly - Green), the Bad (Enemy - Red) and the Ugly (Recently deceased - Blue). Active friendly highlighting temporarily turns off during conversations. 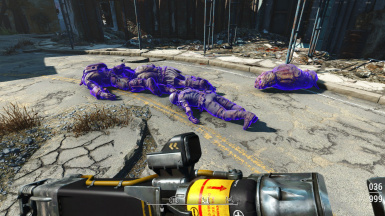 Power Armor versions - Range 1000 (living), 500 (dead). 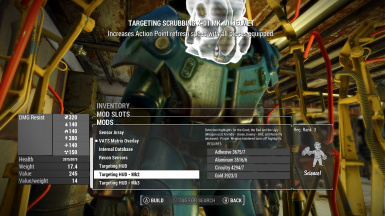 Power Armor eXtended versions include a "Heat cloud" around the target making it "visible" though walls. Detection highlights for the Good, the Bad and the Ugly. (Weapon drawn) Friendly - Green, Enemy - Red, and Recently deceased - Blue. Weapon holstered turns off highlights. Detection highlights for the Good, the Bad and the Ugly. (Weapon drawn) Friendly - Green, Enemy - Red, and (Weapon holstered) Recently deceased - Blue. Detection highlights for the Good, the Bad and the Ugly. Friendly - Green, Enemy - Red, and Recently deceased - Blue. Detection highlights for the Bad. (Weapon drawn) Enemy - Red. Weapon holstered turns off highlights. Video showing Pip-Boy HUD Mk1, Mk2 and Mk3. Also Power Armor Targeting HUD Mk3. 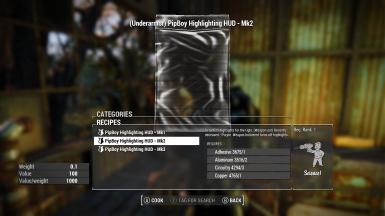 Video showing a sample of Pip-Boy Highlighting HUD - Modular from V2.1. Note: Corpse highlighting does not work on ash or goo piles. 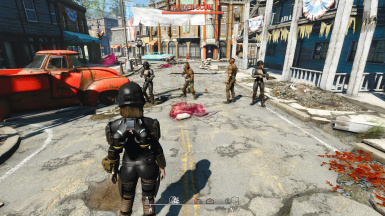 Also will not highlight Bethesda placed dead npc's. Note 2: "Heat cloud" around the target making it "visible" though walls might cause a performance impact. Also the game uses occlusion culling to help performance. This will cause the cloud effect to get blocked behind the culling planes. That issue also affects the games berry mentant version.